Some of the best gifts come in the smallest boxes. They might even show up in a flat envelope. But make no mistake: These presents can fill kids with excitement and provide memories for many years to come. Sorry, Santa, but trendy toys come and go and are quickly forgotten. Game pieces are lost, electronics fail and – oops! – that one is the double of a past birthday gift. That’s why more and more moms prefer that all those generous grandparents, uncles and aunts think in terms of gifts of experiences this year. It’s a great idea for the gift givers, too, who will have the satisfaction of knowing they get the credit for all those trips to the zoo, swimming lessons or theater performances. Gift givers can be a little selfish – no judgment here! – and include themselves in the gift experience to build deeper relationships with their favorite kids. Kids can spend hours engaging in the many creative outlets in the Studio at the Children’s Museum. Photo by Renee Rosensteel, courtesy of the Children’s Museum of Pittsburgh. Museum memberships offer unlimited visits, plus lots of perks, including special member-only events and discounts to museum shops and cafes. An added advantage for those who travel on vacation or to visit families: Memberships include reciprocal agreements for similar organizations in other cities. Membership levels at The Children’s Museum of Pittsburgh consider the many forms of modern families, including single parents, extended families and the ever-popular grandparents category. You can also pair a Children’s Museum membership with the National Aviary in Pittsburgh, located just a couple blocks away. If an entire year’s membership doesn’t fit the budget, gift cards are available from $15 to $150 to contribute to a day of play and exploration. 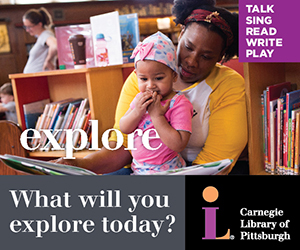 The indoor Ropes Challenge and ziplines are part of the all-ages appeal at Carnegie Science Center’s Highmark SportsWorks. Photo courtesy of Carnegie Science Center. 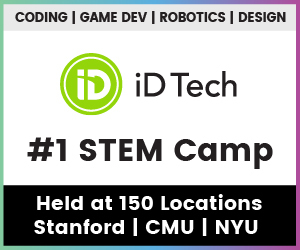 Dinosaurs, robots and hands-on Factory art projects are just the beginning. 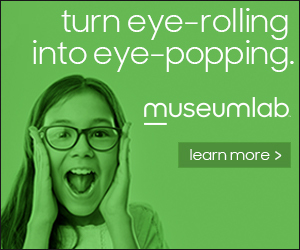 A Carnegie Museums membership is pretty cool because it includes all four very different and very appealing museums – the Science Center, Natural History, Andy Warhol and Museum of Art. A family membership includes two adults and up to four kids, plus admission for a caregiver. If you visit any of these museums twice over a year’s time, that membership turns into quite a bargain. Special exhibits and events – like the LEGO “Art of the Brick” and museum sleepovers – are priced at a discount. Becoming a member of Senator John Heinz History Center is another terrific package of four museums. In addition to the History Center, the deal includes Fort Pitt Museum, Meadowcroft Shelter and Historic Village, plus the Western Pennsylvania Sports Museum. Kids from preschool to high school can learn local history through interactive exhibits, events programming and reenactments. With the history center’s Smithsonian partnership, Pittsburgh is privy to national traveling exhibits, like “Destination Moon: The Apollo 11 Mission,” currently on view. 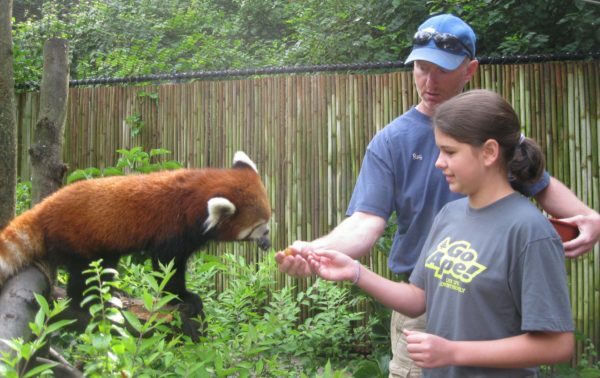 A Wild Encounter brings kids up close and personal with animals at the Pittsburgh Zoo. Photo by Sally Quinn. A hike through Pittsburgh Zoo & PPG Aquarium is like a walk around the world. Sharks, a family of tigers, elephants and gorillas are part of the adventure. The zoo offers a menu of memberships to include an assortment of family styles and sizes. Some include guest passes so kids can treat friends on an outing. Members get discounts on cool activities like Wild Encounters and Wildlife Academy events. With unlimited visits, it’s so nice to pop in for just a few hours rather than spend an exhausting day trying to fit it all in at one go. It’s so fun when kids develop a familiarity, map in hand, and take over as the leader. Gifting a membership to the National Aviary in Pittsburgh provides year-long free admission to spaces like Penguin Point, Tropical Rainforest and Condor Court. Hand-feeding Lorikeets and Free-Flight Bird Shows are part of the appeal. And don’t forget about that membership pairing with the Children’s Museum. This fun new musical is based on a series of books, including “Rosie Revere,” that highlight STEM learning. Photo courtesy of Pittsburgh Cultural Trust. Younger kids will have a laugh at “Your Alien,” part of Citizens Bank Children’s Theater Series. Based on the Tammy Sauer children’s book about a boy who befriends a stranded alien. The pals enjoy lots of fun together until the alien begins to miss his home. “Flight School the Musical” and “Rosie Revere Engineer” are among this charming Cultural Trust series. 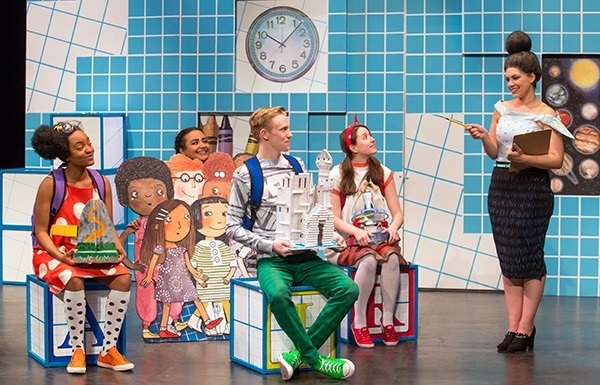 Penny Arcade’s shows for kids give them the chance to participate in creating and performing. These hilarious improv comedies, designed for ages 5 to 12, are planned on Saturdays twice a month, but sell out fast. Tweens will prefer works from the Bridge Series, like “Moon Landing.” This piece recreates the Apollo 11 moon landing with seven actors squeezing into a space about the size of the Mercury capsule. The story of Buddy, a human boy who grows up believing he is an elf has become a favorite holiday movie. 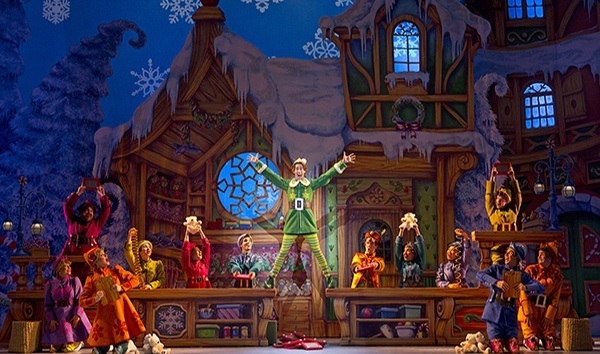 Now, “Elf the Musical” comes to Pittsburgh via Broadway. Circus arts are a blast for all ages. At the Byham Theater, “Cirque Mechanics” will present a mechanical menagerie in a 42-foot circus ring, including a galloping metal horse and a rotating frame with human aerialists, strongmen and acrobats. A large-scale production – 51 acrobats, musicians and singers – takes over PPG Place Arena with Cirque du Soleil’s “Corteo,” a joyous parade imagined by a clown. 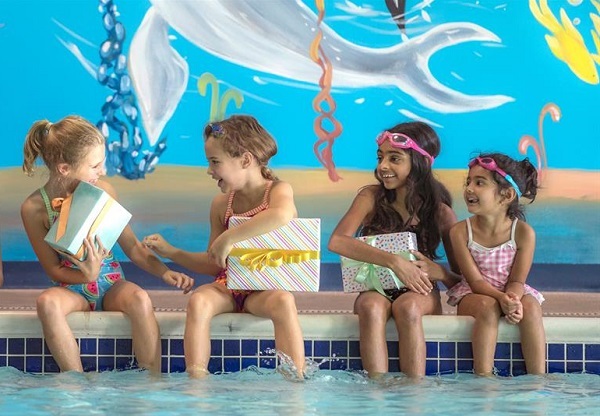 Swimming lessons can be a wonderful gift for kids. Photo courtesy of Goldfish Swim. Keeping kids physically active contributes to their health and helps build confidence as they develop strength and agility. It’s lots of fun, too! Swimming lessons come in all levels of age and ability, from parent-and-baby classes to lifeguard certification courses for older teens. Check out the offerings at area YMCAs and places like Goldfish Swim School. Bonus: Learning to swim teaches kids life-saving water safety. 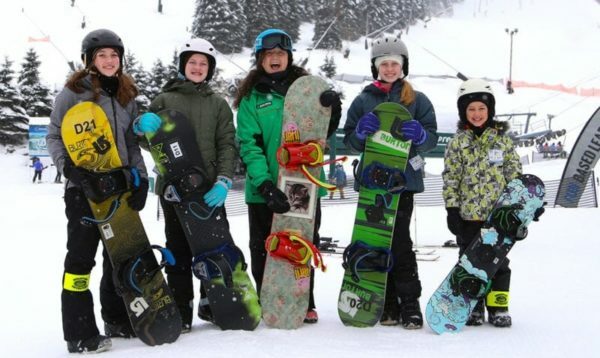 Snowsports School at Seven Springs includes mastering snowboards. Photo courtesy Seven Springs Mountain Resort. Those who love outdoor winter sports will appreciate gift cards for Seven Springs or Hidden Valley ski resorts. They’re good for season passes, ski lift passes, tubing tickets or snow sports classes. Consider outings to ice skating at local rinks, like Schenley Skating Rink and MassMutual Pittsburgh Ice Rink at PPG Plaza. Season passes and gift cards are available for Allegheny County rinks in North and South parks. For those who need a little more confidence on the ice, kids can start skate lessons as young as 3 years at Robert Morris University Island Sports Center. Hockey lessons for kids begin at age 4 through 16 years. The Learn To Skate programs at UPMC Lemieux Complex range from toddler lessons to hockey classes, speed skating and Special Olympics curriculum. A gift to a soccer skills class will build talent between seasons. Photo courtesy of Pittsburgh Indoor Sports Arena. 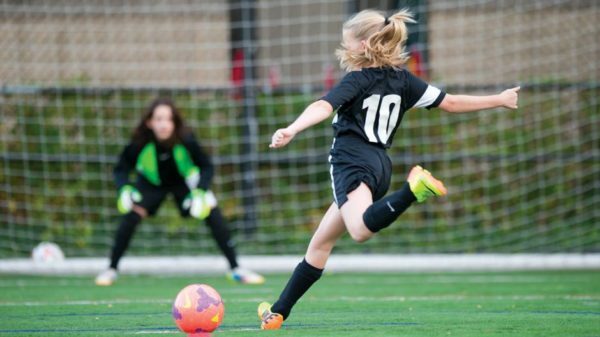 Indoor training for outdoor sports can be found in facilities such as Pittsburgh Indoor Sports Arena, where kids can develop lacrosse skills in Li’l Laxers, get a head start on Tee ball essentials or improve technical ability in soccer. This is a sweet and effective way to teach kids to learn about giving to those in need. Give them an appropriate amount of money and let them choose the charity they care most about. Help kids explore local non-profit organizations and ways they use donations. It’s a lovely way to share the season’s spirit of giving. Also check out Hatch Art Studio — gift certificates are available, and they provide a fantastic experience for kids of all ages!